The Trapper Creek Ranch, est. 1896 and located in the hamlet of Shell, Wyoming – East of Yellowstone National Park and Cody, at the foot of The Big Horn Mountains, is the location of your clinic and retreat center. 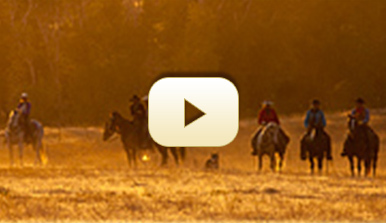 The Trapper Creek Ranch is the sister ranch of The Hideout Lodge & Guest Ranch, one of the leading North American riding guest ranches, with visitors from all over the world. The Hideout is not a nose to tail ranch, instead focused on an upscale riding and horsemanship travel experience with an emphasis on authentic hospitality. Over the years, having access to riders of all levels from all over the world, The Hideout has developed a unique insight into expectations, dreams, wishes and trends among riders worldwide. These insights are shared with The Trapper Creek Ranch and drive the focus and concept of the horsemanship clinics and retreats at The Trapper Creek Ranch. 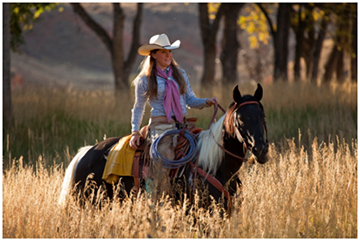 The clinics are spearheaded by your host and clinician, Farrah Green, a 3 Star Parelli Trainer. Farrah can focus on and find answers to your dreams, passions and desires during our horsemanship and riding clinics at The Trapper Creek Ranch. Please read more about Farrah elsewhere in this website. Our clinics are hands on, practical and structured. They are presented in a positive and respectful learning environment for horses and riders. 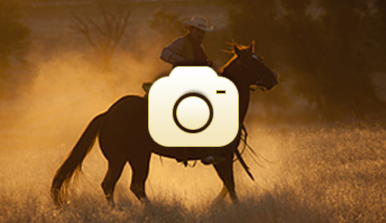 The focus is on horsemanship and riding. We also integrate daily trail rides, so you and your horse can practice what you learn. Concentrating on learning for 8 hours a day is not easy and exploring this exceptional Wyoming country on horseback is an amazing experience and one that is soothing for the heart and soul. Both ranches carry the AH Brand of Authentic Horsemanship symbolizing our commitment to a quality, respectful and open minded equestrian and horsemanship culture. 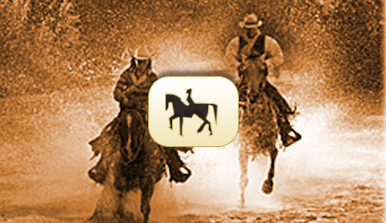 Read more about our AH Horsemanship elsewhere in this website. Our clinician Farrah Green and her Canadian husband Philippe Dube Boucher are your hosts and leaders of this 5-day program. Farrah’s program at The Trapper Creek Ranch offers a choice of Horsemanship Clinics depending on your interest, level of horsemanship and what you and your horse would like to learn. While we have a variety of horses to work with, you can also bring your own horse to the clinic. The clinics are limited to 4 participants each week to keep it personal and maximize your learning. 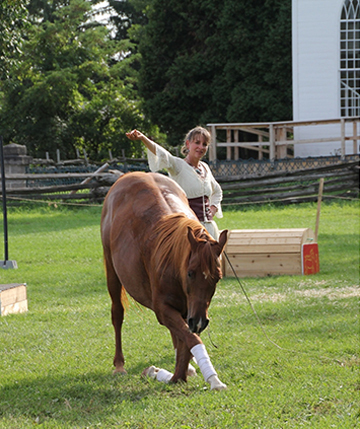 Along with being an experienced Eventer, Dressage and Western Rider, Farrah is a certified 3 Star Parelli Instructor. 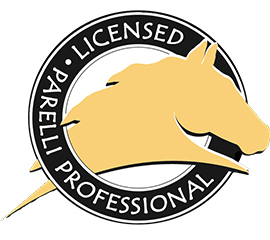 While we do not believe Parelli is the only quality Natural Horsemanship program, our own experience and overwhelming feedback from our guests in North America and Europe teaches us that open minded Parelli Instructors like Farrah Green are top professionals trained in communicating with both horses and humans. Farrah is very skilled in working ridersthrough the Parelli Levels in the different disciplines starting with The 7 Games, Ground work, Free Style Riding, Liberty and Finesse and can do so throughout Levels 1 to 4. Prior to partnering with Farrah for our clinic center at The Trapper Creek Ranch, we have personally worked with Farrah Green for the last two years. Farrah was not only involved in training the crew at The Hideout , but instructed and coached Marijn Werquin, one of the owners of The Hideout to Level 4. We felt that of all the trainers and clinicians we worked with, Farrah was the trainer that fit best with our philosophy, horse culture and views on creating a positive learning environment surrounded by great hospitality. She also came closest in meeting the 10 criteria we were looking forin a trainer. Farrah Green is well established and has a loyal following both in the US and in Canada. Read more about Farrah Green and how we select our trainers at The Trapper Creek Ranch in this website. You will be staying in the comfortable and cozy Trapper Guest House, built in 1925 as a guest house to the historic Trapper Creek Lodge, just adjacent and where the owners of the ranch live. The guest house and lodge were built by the Wyatt family in the 1920’s as part of their private guest ranch. The lodge and guest house are the only examples of the American Arts & Craftsman Architecture in the area. The Guest house offers a comfortable and traditional log cabin atmosphere, with the conveniences and technology that everybody requires such as Wi-Fi and free long distance within the US. There is also air-conditioning, heating, a fully equipped kitchen, living room, three bedrooms, a loft, two bathrooms and a washer/dryer. The porch and views from the porch are to die for and The Trapper Creek runs next to the cabin. 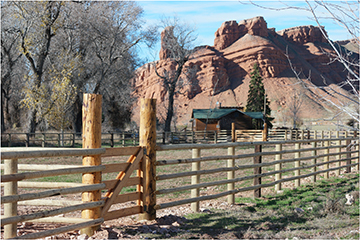 The horses have large wooden pens, and each student will be responsible for the care of their own horse for the week whether bringing a horse or leasing a horse from the ranch. Hay will be provided but students must provide their own grain and supplements. We have several round pens and a 160 x 90 training arena available. The clinics, retreats and training offered changes from week to week. Please continue reading this website for more detailed information. While the courses and levels might be different, the central theme remains the same. You will learn to translate what horses are saying to you and to other horses through their expressions, behavior, and patterns of movement. You will also learn how to train and communicate with horses using your body language. Humans don’t speak or communicate like horses. We often let words get in the way of how we really feel about a person or a situation. Horses are more honest and authentic than this. Therefore, interacting with horses can teach people how to express themselves with more honesty and truth in their own human to human relations. In all this we do not forget you are here to ride and enjoy this beautiful country on horseback. Daily trail rides are part of the clinic. Our clinics are not “one man shows” with one person talking and all the others listening and not participating. Our clinics are about you, your horse and being hands on, working hard and indulging passionately in what you love most. Working with horses and learning. 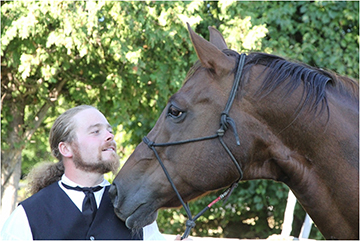 Our goal is to maximize the potential embedded in the relationship between each horse and rider. The setting could not be more picturesque. 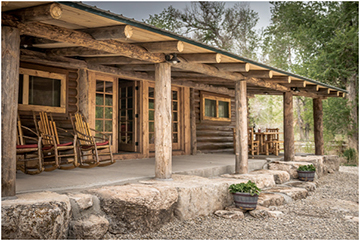 Situated at the foot of The Big Horn Mountains and The Shell Canyon near The Big Horn National Forest, The Trapper Creek Ranch is located at the entrance of The Trapper Creek Canyon. The ranch property is surrounded almost entirely by public lands, with the ranch’s private property in the canyon surrounded by a wilderness area. 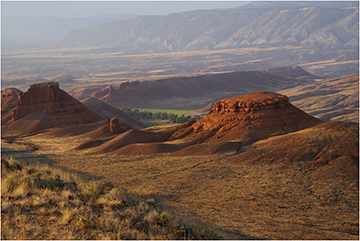 The red Sedona rocks of the Chugwater formations are breathtaking. No wonder this is where the first settlers built their cabins and is the location of one of the earliest guest ranches in this area of Wyoming.